↑ Zachary Keck (30 May 2014). 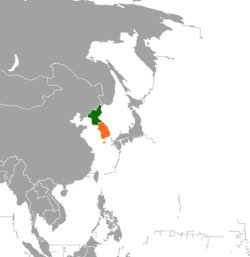 "South Koreans View North Korea as Cooperative Partner". The Diplomat. पहुँचतिथी 30 May 2014. ↑ 4.0 4.1 Taylor, Adam (27 अप्रैल 2018). "The full text of North and South Korea's agreement, annotated" – वाया www.washingtonpost.com. ↑ "ऐतिहासिक वार्ता के लिए दक्षिण कोरिया में दाख़िल होंगे किम जोंग-उन". बीबीसी. 27 अप्रैल 2018. पहुँचतिथी 28 अप्रैल 2018. ↑ "Location of planned inter-Korean summit hints at changes in North Korea strategy, say experts". The Straits Times. 8 मार्च 2018. पहुँचतिथी 24 मार्च 2018. ↑ Sang-Hun, Choe (2018-04-27). "North and South Korea Set Bold Goals: A Final Peace and No Nuclear Arms". The New York Times (English में). ISSN 0362-4331. पहुँचतिथी 2018-04-27. ↑ Kim, Christine. "Korean leaders aim for end of war, 'complete denuclearisation'..." U.S. (English में). पहुँचतिथी 2018-04-27. ↑ "North Korea and South Korea make pledge to connect border railways - Global Rail News". 27 April 2018.